Draw a beautiful illustration of a dog and then learn how to create different versions of this cartoon animal using various colors and patterns. Nothing is more enjoyable then working on an adorable cartoon dog drawn using cool shapes like circles, triangles and curved lines. In this lesson, I will show you how to assemble all these shapes to create a character that can easily be sketched by anyone! However, before proceeding with the actual drawing tutorial, why not spend a few minutes studying this cartoon animal carefully so that we can understand what makes this character so special? On top of the head, a few hair are visible. The eyes are made from medium circles and the pupils are created with dots. A large mouth made from curved lines can be seen. The neck is narrow and created from long curved lines. The tail is filled with hair and done using a long triangle. Don't forget to draw small lines on the feet. The legs visible behind the character should be darker to show some perspective. A big red tongue can be seen near the mouth of the animal. A few hair are shown on both sides of the cheeks. The nose is large and drawn using a triangle. Both ears are long, large and located on top of the head. Do you feel more confident now? I hope so! 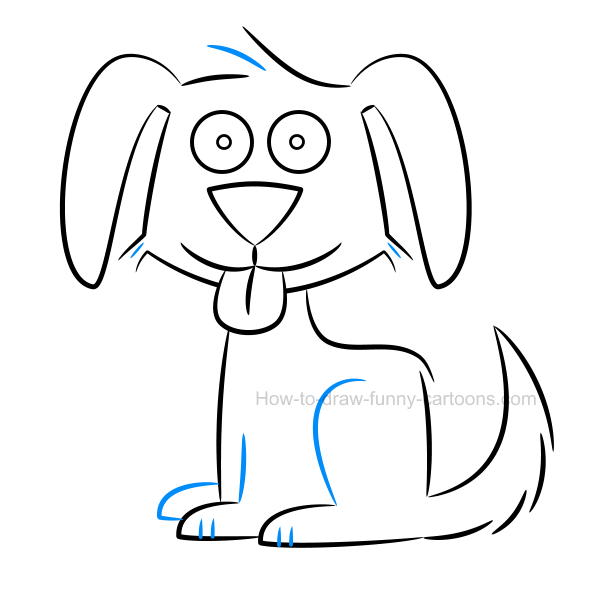 Let's draw this cartoon dog in just five easy steps using the drawing lesson found below. 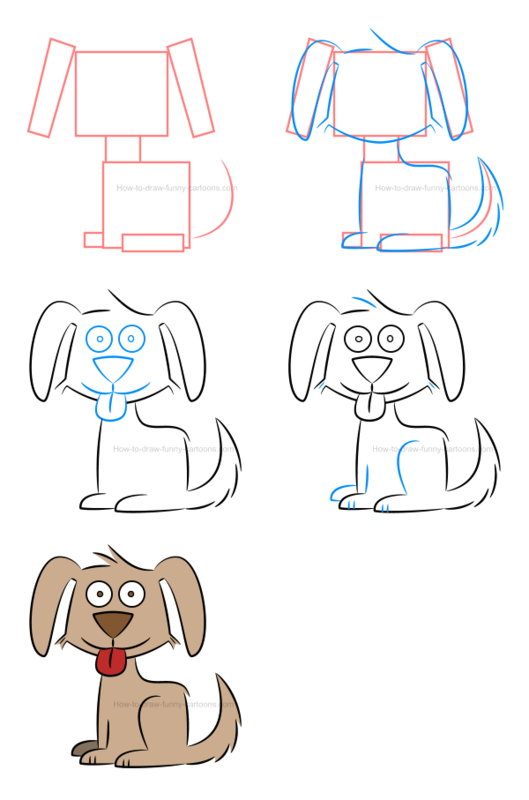 Then, I will show you how to create more dogs using the same template! 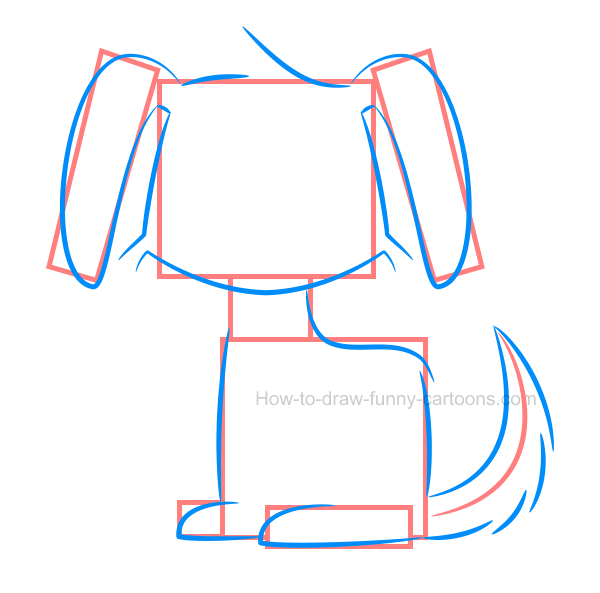 Let's sketch a few basic shapes to help us draw this illustration of a dog more easily. First, add a large square to represent the head of the animal. Then, draw two long rectangles to illustrate the ears. The neck is done using a small square and the body using a large one. Sketch two more rectangles to form the feet and add a line to create the tail. 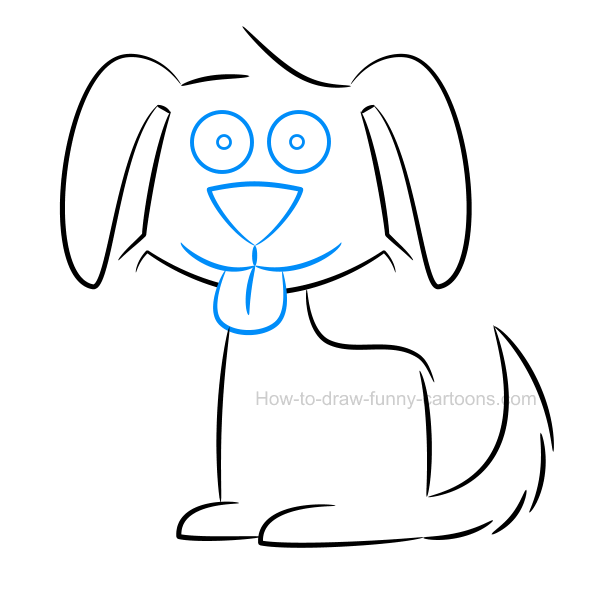 Step 2 - Let's draw this adorable illustration of a dog! Using a whole variety of curved lines, you can now draw the character using the basic shapes created in the previous step. Pay attention to areas like the top of the head, the cheeks, the tail and the legs. 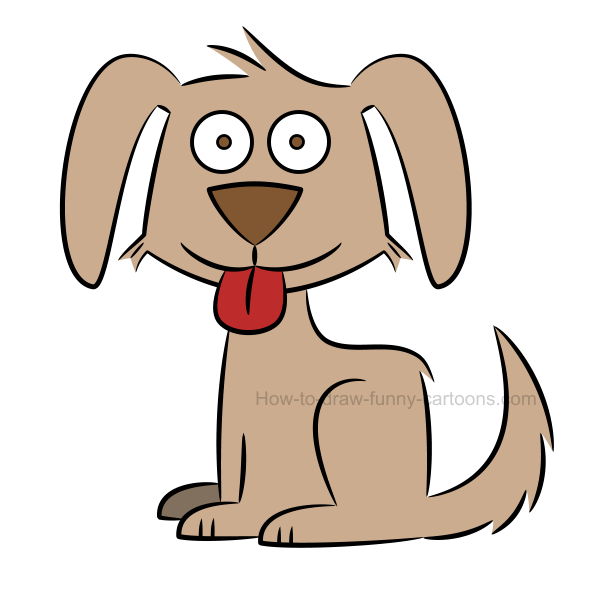 Once you are done illustration this dog, you can remove all basic shapes used as a template. Inside the head, sketch two large circular shapes to represent the eyes. Inside these eyes, draw pupils using small dots. Then, you can create the nose using a large triangle as shown in the illustration below. Finally, complete this step by creating the mouth using curved lines and adding the tongue using a few basic lines. On top of the head and near the cheeks, add small lines to create more hair. 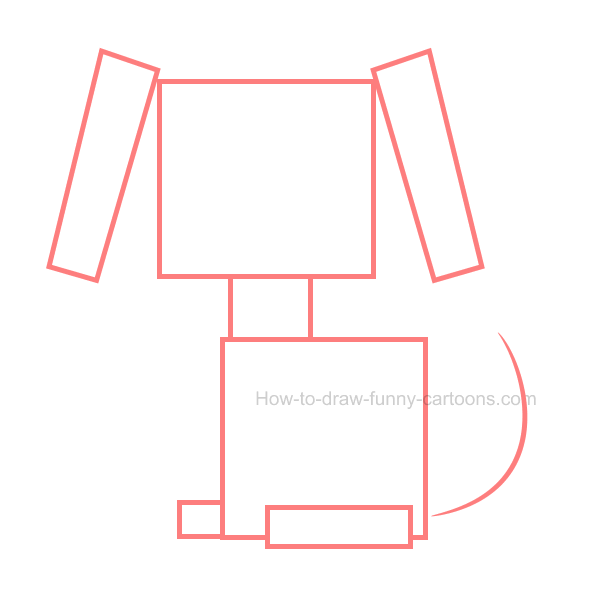 Then, you can draw a long curved line inside the body to illustrate the back leg of the cartoon animal. Smaller lines are also added inside the feet. It's now time to add colors and make this illustration of a dog even more appealing! step 5 - brown is the selected color ... for now! You can now color the whole character using a simple brown color. Make sure that the nose and the pupils are darker. The tongue can be colored in red while the feet located behind the cartoon dog can be slightly darker than the body. Of course, the eyes must remain white. All colors inside this version of our little cartoon friend are now darker. Even if the modification is simple and quite subtle, the result is still quite different. Yes, it's still the same dog, but its personality is already affected by this simple addition. Let's go back to the original colors. 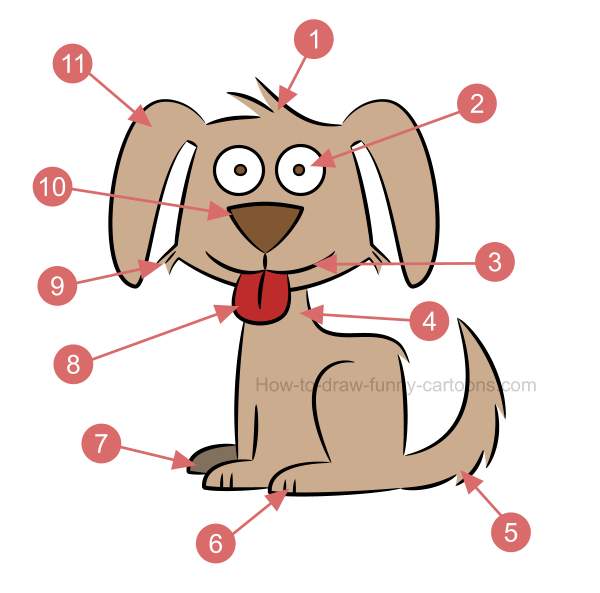 This time, let's sketch a few patches on the body to create a simple pattern on the skin of the cartoon dog. Once again, the result might feel a little bit too similar to the original one and this technique is not the most appropriated one to achieve our goal. 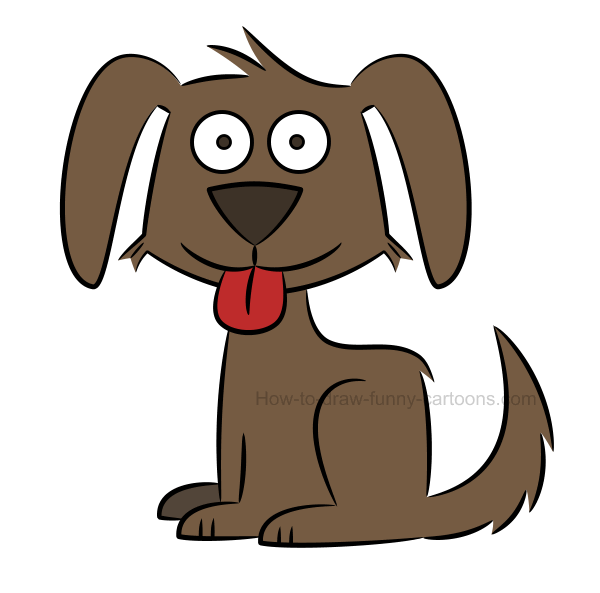 For this new alternative, let's draw a large dark patch around the left eye of the dog and let's switch the brown color for a grey version instead. This new character looks more like a puppy than a dog. That's largely because of the patch now found around the eye of the animal. We are getting closer! 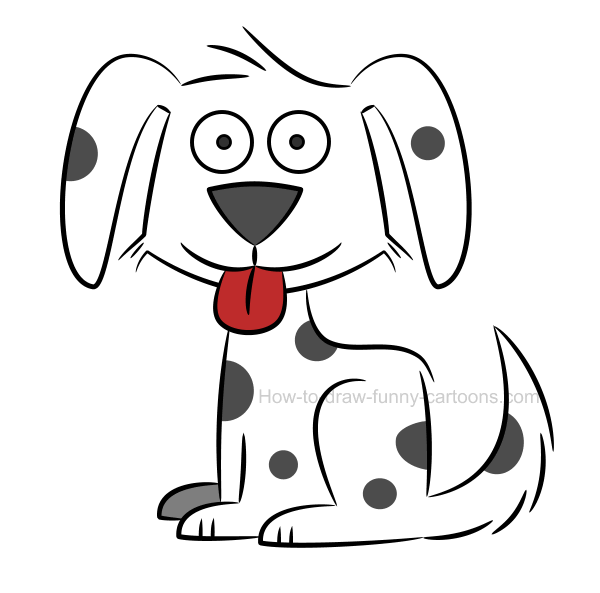 5. black and white ... it's a dalmatian! In this final attempt, the body of the character is now filled in white and black patches can be seen all over the body, the tail and the ears. Looks familiar? Of course! It's a dalmatian! Now you can see how this illustration of a dog can look different simply by adding new colors and new patterns. Don't hesitate to experiment by mixing several features together (patches around the eyes, colors, textures, patches on the body, patterns) and see how it goes. Possibilities are almost endless and once you are ready to draw new shapes and sketch new lines, you will discover that anything can happen!